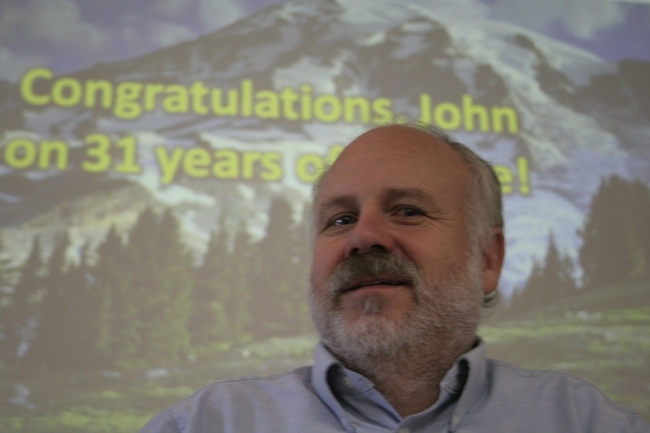 The Kearney community marked the retirement of its long-time computer programmer John Rassmussen today. John came to Kearney shortly after graduating from college to manage a brand new integrated pest management outreach system located at the field station. In 1981, IPM was delving into computer communications by offering a weather database, news features and pest management guidelines that could be read on terminals at UC Cooperative Extension county offices. The computer at Kearney - with its 96 megabyte hard drive and one-quarter megabyte internal memory - cost $125,000, John said. It was connected to terminals in Bakersfield, Visalia, Shafter and Fresno via dedicated phone lines. Over the years, as technology advanced, John became the self-taught network administrator and computer support professional for the scientists and staff at the Kearney Agricultural Research and Extension Center. An avid outdoorsman, John plans to spend more time hiking, caving, mountaineering and endurance running during retirement. 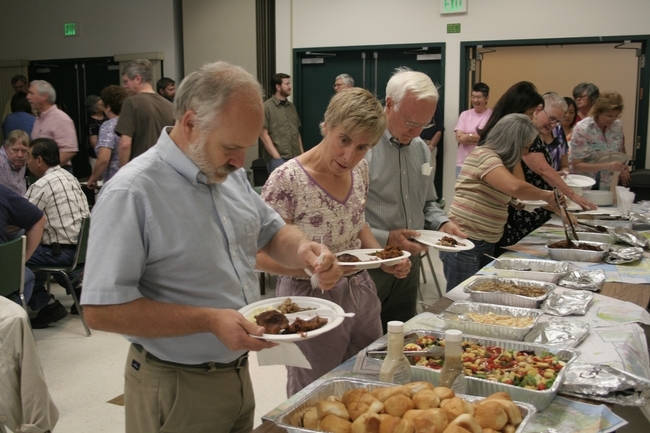 John and his wife Marcia lead the buffet line. 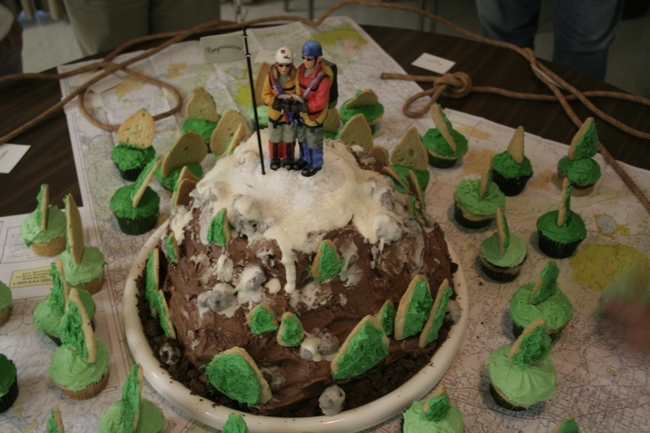 Kearney artist Gwen Conville created a "mountain" cake for the retirement gathering. Staff and academics at the UC Kearney Agricultural Research and Extension Center (KARE) hosted the Central California Blood Center's Blood Mobile today. In all, 22 people stepped up to donate a pint. The Central California Blood Center says more than 75 percent of Americans who reach age 72 will need blood at some point in their lifetimes; 97 percent will have a loved one or friend who will need life-saving blood. Among the most common procedures that require blood are heart surgery, accidents, organ transplants and bone marrow transplants. Since blood is a fragile, liquid living tissue, it has a limited shelf life. Red blood cells last 42 days, platelets last 5 days, and plasma can be frozen and stored for one year. 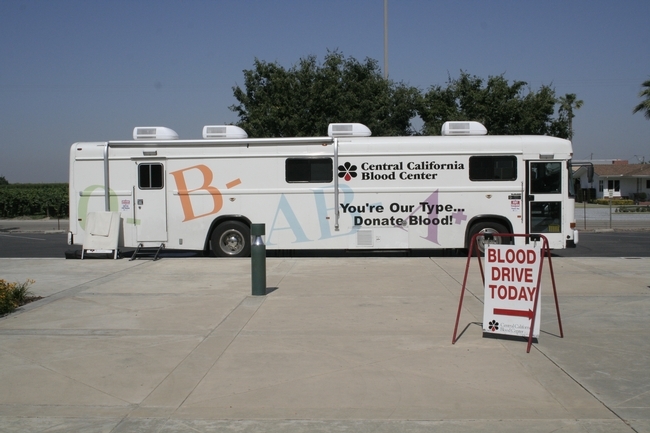 CCBC is the sole provider of blood donations to hospitals in Fresno, Madera, Tulare, Kings and Mariposa counties. It strives to always maintain a five- to seven-day supply of blood. 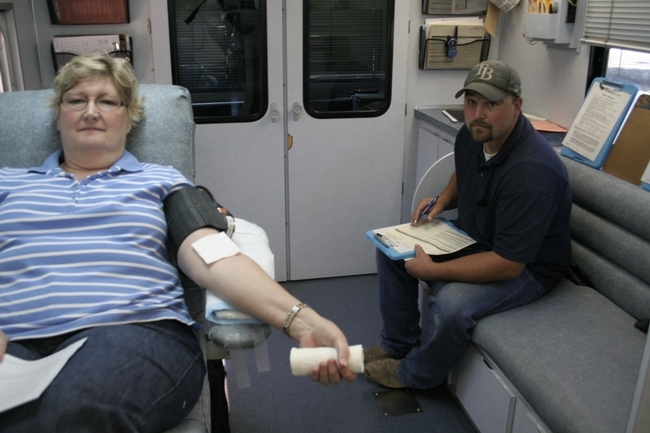 The Kearney blood drive was organized by KARE safety coordinator Alan Cary. 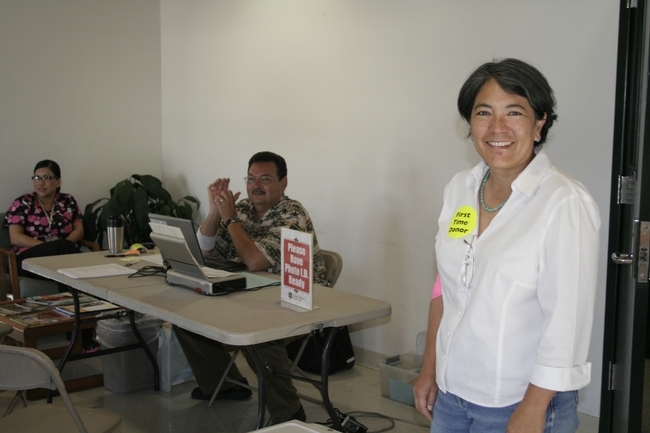 First-time donor, Jarnelle Naikaima, an administrative manager at Kearney. Staff research associate Sue Collin (left) and physical plant mechanic Patrick West prepare to donate. 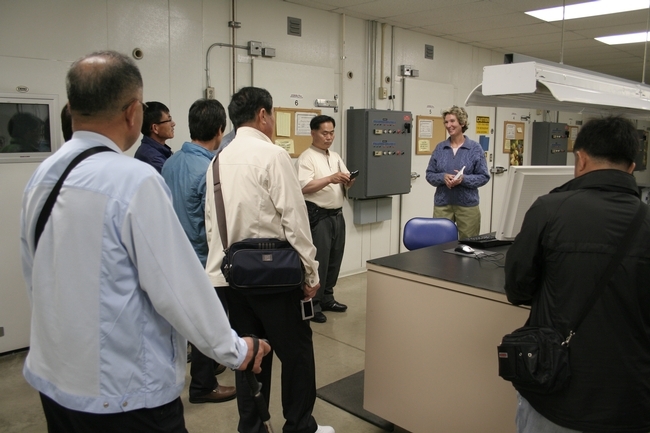 A group of farmers from Tongyeong, South Korea, visited the UC Kearney Agricultural Research and Extension Center today to learn about the scope of research activities under way at the facility. 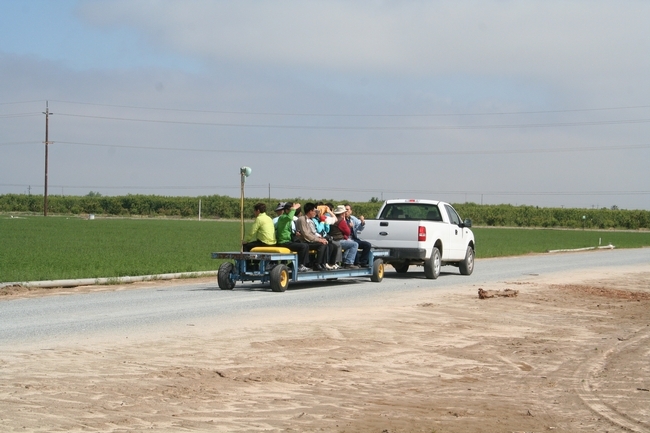 The visit was arranged by the City of Reedley, situated 4 miles east of Kearney. Reedley and Tongyeong are sister cities. The visiting farmers produce a diversity of crops in South Korea, including citrus, strawberries, orchids, kiwis, mangos and figs. At Kearney, they toured the post harvest facility, research plots and the greenhouse. This afternoon and tomorrow they will visit local farms and packing houses. 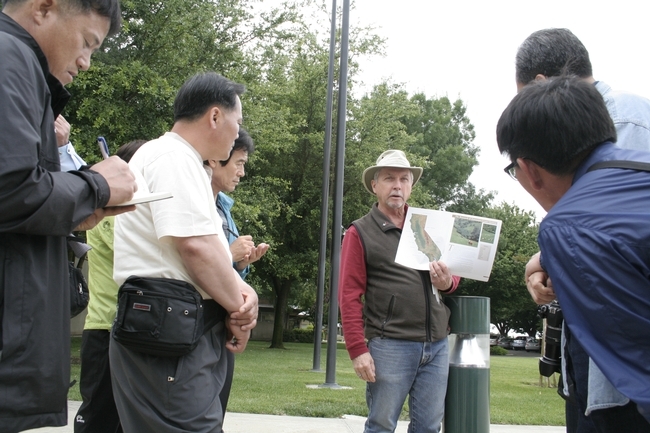 The Korean farmers showed particular interest in UC's Navel and Valencia Export to Korea (NAVEK) program. In 2004, Korea rejected incoming citrus from California when inspectors detected fruit infected with Septoria spot, which is caused by a pest that has not been reported in Korea. UC scientists developed a fruit certification program to ensure that fruit with Septoria spot isn't shipped to Korea. The Korean farmers' week long trip to the United States will not be all business. They plan to take time to visit the Grand Canyon National Park in Arizona and Las Vegas, Nev., according to their guide, Sonny Er. Kearney superintendent of agriculture, Chuck Boldwyn, introduces the visitors to the California agriculture industry. Assistant KARE program and facility coordinator, Julie Sievert, leads a tour of the Mitchell Post Harvest Research Center. 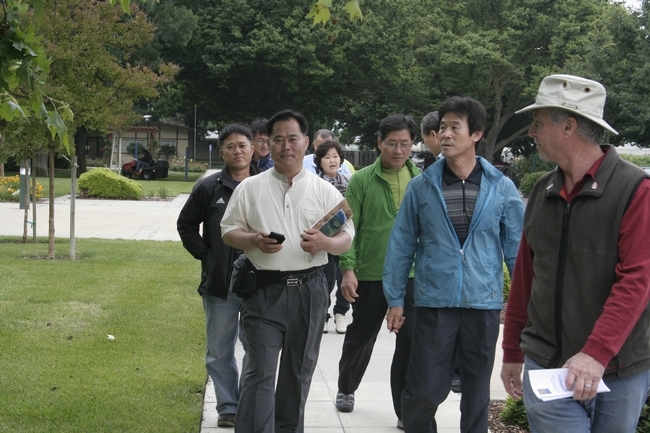 Korean visitors tour Kearney's extensive research plantings. South Korean farmers pose with a banner from home at Kearney. With the cooler weather and later developing cotton crop in the San Joaquin Valley, 2011 is providing some challenges to cotton production. Add to that challenge the possibility of moderate to severe Lygus outbreaks in some locations. The large amount of rainfall this winter and spring will set the stage for more Lygus in summer. The relationship between historic rainfall records and annual cotton loss estimates supports the idea that Lygus will be more problematic this year and observations from the ground confirms this assessment. However, as in other years, the primary source of Lygus will be from crops and locations within a few miles of your cotton field, not miles away from the edge of the Valley. 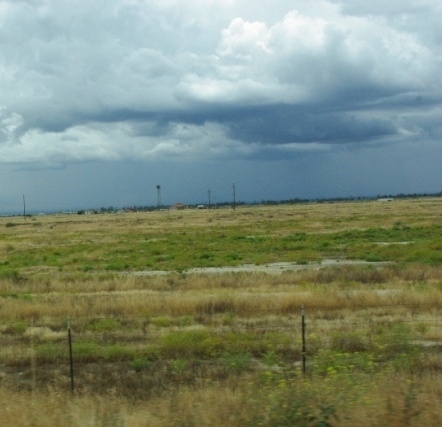 Foothills are generally dry and limited Lygus hosts, due primarily to early rains that favored grasses over broadleaves. 2011 was not a great year for wildflowers in the Sierra foothills due mostly because of the heavy grass prevented the annual broadleaves from developing widely. Along the I-5 corridor, tarweed, a key indicator host for Lygus, is located mostly south of Highway 198. It is more common on the valley flats than on the coastal foothills. When sampled 2 weeks ago, the population was split between overwintering adults and first generation nymphs, 1st to 3rd instars. The further south I travelled the more tarweed I could find in uncultivated areas of Kern County, commonly known as “deserts”. The importance of tarweed is not as much it is a major source for the Valley but rather as local infestation point and indicator of potential problems. Tarweed is a good plant for Lygus development because it spans the late winter and summer periods. It acts as a bridge for Lygus to develop a foothold and increase its numbers during May and parts of June. Without that bridge, populations tend to disperse and build slower and later. Safflower plays a major role as a plant host bridge, allowing overwinter populations to settle and reproduce. Safflower plantings are spread throughout the Valley and will act as localized sources for Lygus into susceptible crops. The problem can be alleviated by managing Lygus population in safflower before the nymphs can become adults and leave the field. For details on managing Lygus in safflower to mitigate movement into cotton, refer to IPM in Cotton in the Western Region of the US, UC ANR Publication 3305. 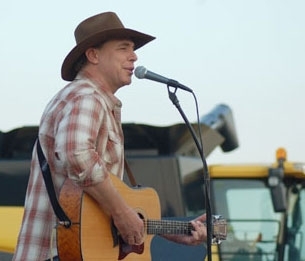 The first stop on country music artist Michael Peterson's whirlwind tour of San Joaquin Valley agriculture today was the Kearney Agricultural Research and Extension Center, where he enjoyed fresh fruit produced by local farmers and was introduced to the science behind the California agricultural industry's tremendous success. Peterson was in the Fresno area as a guest of the World Ag Expo, the largest agricultural trade show in the world, which takes place each February in Tulare. Expo organizers are exploring the development of a partnership with Peterson to help spread the word across the nation about California agriculture. Peterson was a member of 4-H as a youth in eastern Washington. That early exposure to agriculture, he said, may have planted the seed that developed into his current affinity for the farming industry. Peterson brings a measure of celebrity to the effort to share the message about California agriculture. His country music debut album in 1997 produced four hit singles, “Drink, Swear, Steal and Lie," "From Here to Eternity," “Too Good To Be True” and “When the Bartender Cries.” He was named Top New Artist of 1997 by Billboard and Radio & Records and honored as Country Weekly's Male Newcomer and Gavin's Artist to Watch in 1998. More recently, Peterson has been active in youth development and veterans' programs. He presents a school assembly called "Tag, You're It," which blends illusions, humor, interactive multi-media, audience participation and the power of the internet to help improve test scores and boost high school graduation rates. He has also traveled to Iraq several times to perform for the troops and is creating a music project for the Military Child Education Coalition. Peterson said he was impressed by his visit to the Kearney Agricultural Research and Extension Center. "I never thought about the science part, on this level, being so important in agriculture," he said. "Thank goodness y'all are here."  In the video above, Michael Peterson expresses esteem for California agricultural science. For a transcript of the video, please email jewarnert@ucdavis.edu.